Everything that lives on earth has a life cycle. Life begins, it grows, it reproduces, it dies. But what is a plant’s life cycle? Plants start their lives as tiny seeds. Seeds can be as tiny as a grain of side or bigger than a fingernail. Some are round, while others are flat or tear-shaped. Inside a seed is an embryo, which is a tiny plant, and the endosperm, which are small leaves which supply the embryo food. The outside of the seed has a seed coat, which protects the embryo from injury or drying out. Inside a seed is an embryo, which is a tiny plant. The outside of the seed has a seed coat, which protects the embryo from injury or drying out. Some seeds have very hard seed coats. Others have soft seed coats. Morning glory flowers have hard seed coats. Some gardeners soak the seeds in water or nick them to soften the coats so they’ll grow faster. Some seeds need cold temperatures to break down the seed coat. This is called stratification. All seeds need moisture, oxygen and the right temperature to germinate, or grow. Until they have these conditions, the seed remains dormant and does nothing. Some seeds need light to germinate. Others need darkness. Once the seeds have the right conditions, the plant inside starts to grow and get bigger. It pushes open the seed coat – sort of like a chick hatching out of an egg. Tiny leaves appear and push out of the soil. Some plants, like ferns, don’t produce seeds. They make spores. Look under the leaves and you’ll see rows of tiny round spores. These drop off the plant and eventually make new plants. Animals often eat seeds. The seeds come out in the animal’s poop. They drop to the ground and make new plants. Some seeds are carried to new places by the wind. Seeds don’t grow well if they land right underneath the parent plant. There’s not enough light, water or nutrients here. Some plants, like ferns, don’t produce seeds. They make spores. These drop off the plant and eventually make new plants. A video explanation of how a plant germinates from a seed and grows into a plant. Question: Do people ever eat seeds? Answer: Many seeds are nutritious and delicious. How about poppy seeds, sunflower seeds, chia seeds or pumpkin seeds? Seeds are not the same as nuts. Question: Can a seed get too much water? Answer: When the soil is soggy, seeds can’t get oxygen. They rot and don’t grow. 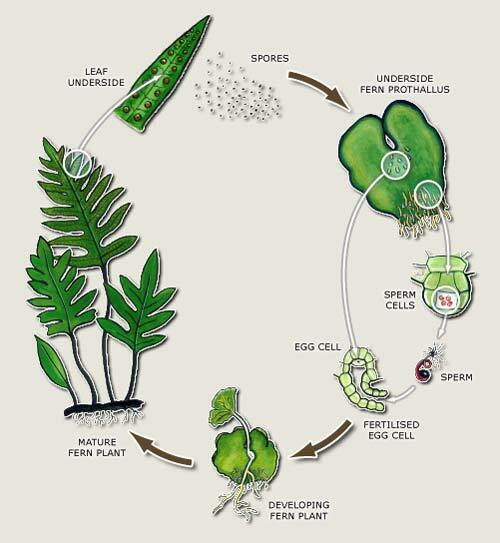 Enjoyed the Easy Science for Kids Website all about Germination and Reproduction of Plants info? Take the FREE & fun all about Germination and Reproduction of Plants quiz and download FREE Germination and Reproduction of Plants worksheet for kids. For lengthy info click here. Declan, Tobin. " Fun Germination Facts for Kids ." Easy Science for Kids, Apr 2019. Web. 26 Apr 2019. < https://easyscienceforkids.com/all-about-germination/ >.